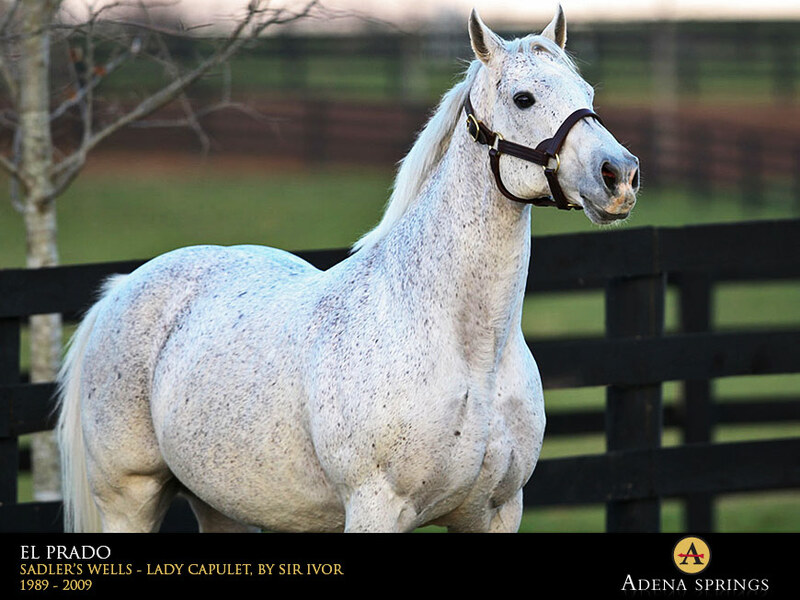 We were greeted this week with the news that America’s Champion Breeder and Summerhill client, Adena Springs, had sadly lost their resident and leading sire, El Prado, indeed one of the world’s elite. The Thoroughbred Daily News reported yesterday that El Prado (Ire) (Sadler’s Wells - Lady Capulet, by Sir Ivor) died of aheart attack soon after being turned out into his paddockMonday morning. Still active at 20, the stallionstood for $75,000in 2009. Althoughwell accomplishedon the racetrack,El Prado scalednew heights atstud, siring eightGrade I/Group 1and 30 gradedstakes winners,and a total of 74horses who triumphedat thestakes level. The stallion’s leading earner is multipleGrade I winner Medaglia d’Oro. On the track, the Darleystallion won the 2002 GI Travers Stakes, 2003 GI WhitneyHandicap and 2004 GI Donn Handicap, and was runner-up in both the2002 and 2003 GI Breeders’ Cup Classics, as well asthe 2004 G1 Dubai World Cup. Medaglia d’Oro’s racingaccomplishments helped El Prado earn leading sirehonors in 2002, and saw the grey’s stud fee increase to$75,000 in 2003. Medaglia d’Oro quickly assertedhimself as a leading sire in his own right with the likesof GI Preakness Stakes winner Rachel Alexandra in his firstcrop to race. El Prado is also the sire of 2004 ChampionTurf Horse Kitten’s Joy, a top Freshman sire; PuertoRican Champion Mi Pradera; and Grade I winners Artie Schiller, Borrego, Asi Siempre and Spanish Moon. As abroodmare sire, he is represented by Grade I winners Bit of Whimsy (Distorted Humor) and Laragh (Tapit). In the sales ring, El Prado was represented by his first seven-figure sales horse when This is That brought $1 million as a juvenile at the 2003 BESMAR Sale. In 2007, Asi Siempre sold for $3 million as a broodmare prospect at FTKNOV, and the following year, Flagship sold for $1 million at the 2008 Keeneland September Yearling Sale. Earlier this season, a juvenile colt by the stallion topped the OBS March Sale with a $450,000 final bid. Group 1 winner El Prado was bred in Ireland by Lyonstown Stud and was campaigned by Robert Sangster and legendary trainer Vincent O’Brien. Out of 1977 Irish 1000 Guineas winner Lady Capulet, the gray is a half brother to 1987 Irish champion three-year-old Entitled (Ire) (Mill Reef). As a two-year-old, El Prado won four of six starts, including the G1 National Stakes, G2 Beresford Stakes and G3 Railway Stakes, and was named Ireland’s champion juvenile of 1991. Off the board in three starts in 1992, El Prado was retired to Brereton Jones’s Airdrie Stud in Midway, Kentucky in 1993, standing for the partnership of Sangster, O’Brien, Coolmore and Frank Stronach. 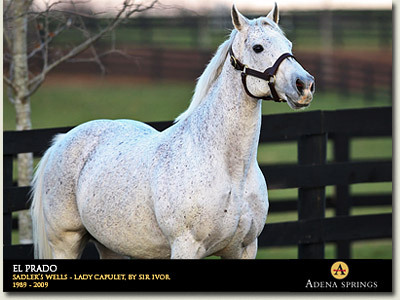 Initially offered at a fee of $7,500, he ranked eighth on the 1996 freshman sire list with progeny earnings of $398,925. In 1998, after renovations on the farm were completed, the stallion moved to Stronach’s Adena Springs.